Mary is an impressive woman – young or old. God obviously thought so too as He called her favored among all women. Her expectations for her entire life were disrupted, yet she was able to immediately say … “May it be to me as You have said.” She responds with these words of trust and faith to the God she serves without knowing how Joseph or her family will respond to this news. I have been pondering Mary’s response. Her response reminds me of how little I actually control and how God constantly wants me to trust Him with my life plans. Slowly (too often painfully slow), I am learning to respond with words of trust and faith. I want to be more like Mary, to trust in His sovereignty plan no matter what. To say with certainty and boldness, like Mary “May it be to me as You have said’. I am delighted to share Recognize and Remember’s Devotional Study on Accepting God’s Plan. 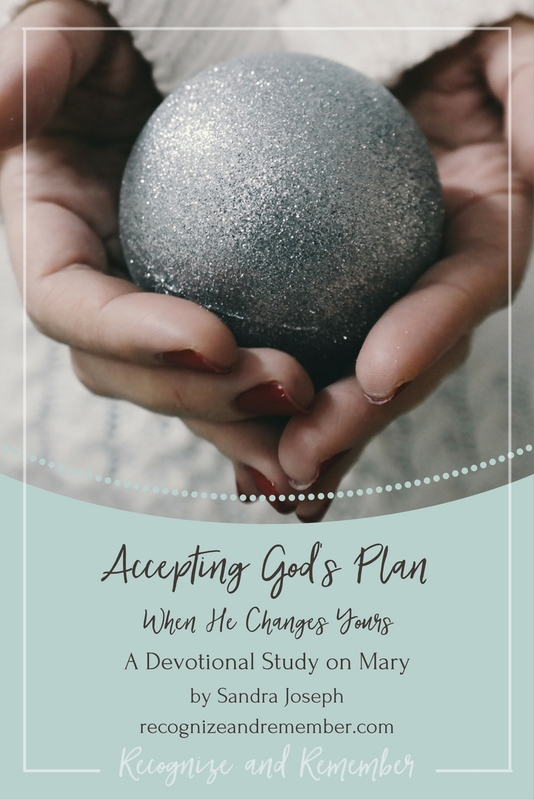 Join me to dig deeper into the study of Mary, who accepted God’s plan for her life. This woman’s journey will fulfill God’s purposes for His story of redemption. I love how God shares the stories of women like you and me through His scriptures. To participate in the study, just fill out the form below, click to confirm in the email you’ll receive, then access to the study will arrive in a second email in your inbox. I look forward to discussing the study with you!